Why Cap M.U.N. at 36 Delegates? First the good news: MUN is a very popular group. The trip to the NYC conference is even more popular. This year we have the largest group ever signed up to go: 81 students, which is 20.25% of the student body. Now the bad news: MUN is a very popular group. So popular that 20.25% of the student body of East was scheduled to be in NYC the first week of March. Now the reality: The school's administration (Mr. Marble and Mr. Hieser) has decided to limit the number of students who can go to the NYC Conference. They reached this conclusion based on educational priorities for the students who will be attending the conference and missing class, and those students who aren't going and miss the interaction of one-fifth of their peers within their classes. There are so many students scheduled to go it will actually affect teacher planning for those three school days in March. This was a much larger group in 2013. 1. You must have already submitted your $100 deposit and parent signature form to Mr. Hyer. 3. Based on the strength of the essay and past leadership and commitment to the MUN club, Mr. Hyer and Mr. Fetzer will choose up to four students each from the sophomore, junior and senior classes. These students will be exempted from the lottery. The Lottery Program is D-A OK! Mr. D-A has provided the program to provide the lottery results. It is the Sturgis-used math program, Fathom. In the words of D-A, "There's certified math in this here lottery!" 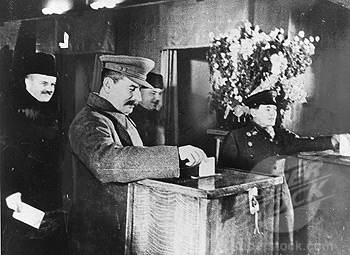 Stalin casting a Ballot with Molotov's oversight. Unlike the '47 Polish elections, however, the MUN lottery isn't rigged. 5. Within the lottery, NO preference will be given to siblings, friends, girlfriends/boyfriends, etc. Students will be assigned a place in line using the Math-department-approved random sequence generator. After the class has reached its limit, a waiting list will be created in case those chosen cannot attend the conference due to illness, academic, or behavior reasons. 6. Those chosen to attend the conference are guaranteed a spot as long as they continue to attend weekly meetings, make all of the required deadlines for position papers, and behave in a manner consistent with the MUN expectations. Students straying from this path can expect a meeting with Mr. Marble, Mr. Fetzer and Mr. Hyer to discuss their behavior. For those not selected in the lottery, full refunds will be issued. Checks will be made out to parents and mailed to them. ALL Essays are to be uploaded to the MUN ManageBac class by Friday, Oct. 3 by 12:25 p. Late essays will NOT be accepted!! Example of what you'll will see on your MB home page! IF YOU CANNOT FIND THE MANAGEBAC GROUP notify Mr. Fetzer immediately. Failure to find the group is NOT an excuse for a late submission. You must submit a scholarly essay on one of three current international problems. The three topics have been chosen by Mr. Fetzer. See attachment at the bottom of this page for complete rules. This essay MUST be submitted electronically to Mr. Fetzer via Managebac no later than 12:25 p., Friday Oct. 3. NO EXCEPTIONS. Based on the strength of the essay and past leadership and commitment to the MUN club, Mr. Hyer and Mr. Fetzer will choose up to four students each from the sophomore, junior and senior classes. These students will be exempted from the lottery. Your essays are received at M. Fetzer headquarters.